Presents the first book available on matrix algorithms implemented in real computer code. Provides algorithms covered in three parts, the mathematical development of the algorithm using a simple example, the code implementation, and then numerical examples using the code. Allows readers to gain a quick understanding of an algorithm by debugging or reading the source code. 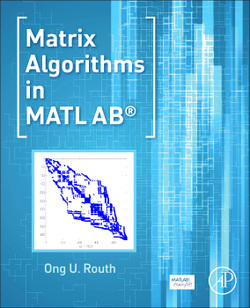 Matrix Algorithms in MATLAB© focuses on MATLAB code implementations of matrix algorithms. The book aims to provide an overview and classification of the interrelations of various algorithms, as well as numerous examples to demonstrate code usage and the properties of the presented algorithms. The MATLAB codes presented in the book are tested with thousands of runs of MATLAB randomly generated matrices, and the notation in the book follows the MATLAB style to ensure a smooth transition from formulation to the code. Most MATLAB codes discussed in this book are kept to within a hundred lines for the sake of clarity. Despite the wide availability of computer programs for matrix computations, matrix algorithms continue to be an active area of research and development. New applications, new algorithms, and improvements to old algorithms are constantly emerging. This makes Matrix Algorithms in MATLAB a useful resource for researchers and practitioners working in engineering fields that require them to master the ability to implement and improve matrix algorithms. This book can also be used as a useful supplementary resource for students studying matrix calculations and linear algebra.